Find out and book for our upcoming seminars here. Download presentations here: Introduction (Amy), Adrian, Clare, Dan, and some notes on the comments from the floor. Plus a briefing on how active travel can improve educational attainment. Our 30th seminar took place at London's City Hall, on Tuesday 6th March 2018 at 6pm, and was a session on Healthy School Streets. Currently, over 1500 London schools and educational settings participate in TfL's STARS scheme, striving to increase the numbers of children using active travel to get to school each day. However, many parents are still choosing to drive their children to school, creating issues around road safety, air quality and childhood obesity, all of which are becoming ever more pressing concerns for school leaders and parents alike. The seminar discussed some of the strategies taken to make the journey to school safer and healthier for London children. The session was hosted by Caroline Russell (London Assembly member), with talks from Public Health and Transport specialist Dr Adrian Davis, Dan Kelly (former parent governor at Stoneydown Park Primary, Walthamstow) and Clare Rogers (Better Streets for Enfield) and an interactive discussion session. Our launch event was a great success with around 120 people listening to, and quizzing, Andrew Gilligan, London's Cycling Commissioner. Andrew spoke for around half an hour, followed by a wide-ranging discussion taking in cycling infrastructure, HGVs, cycling to school, car parking, mini-Hollands in Outer London and a host of other topics. The event was impressively chaired by Danny Williams (Cyclists in the City blog, LCC City of London), who had to cope with a forest of hands - we didn't need to worry about not having enough questions, as it seemed nearly everyone wanted to say something. Thanks to all those who attended - for those who missed it, you can access an iTunes/M4A version (20MB) of the audio here, or an MP3 version (30MB) here. (1hr 25 minutes). Thursday 2 May – Modelling a Transformation for Cycling in London: A participatory workshop to start developing a systems model for cycling in London (Alex Macmillan, UCL; James Woodcock, CEDAR). Around 30 people attended this very interactive session, building our understanding of how the 'cycling system' works in London - and thinking about how it could work differently in the future. Till Koglin from Lund University in Sweden spoke about his research comparing cycling experiences in Copenhagen and Stockholm. Around 20 people joined in a lively discussion that among other questions asked what London can learn from the two cities. Workshop on campaigning for cycling in the local elections. More here. Commuting in West London, with Peter Mynors. Slides here (pdf file). Around 40 people attended our first Autumn event, from a variety of stakeholder and advocacy groups. Discussion about how we understand and define good cycle routes lasted well into the evening. You can see Brian and Paul's slides here (pdf file). 20 people took part in a lively discussion at this workshop style event, after talks by Phil and Tom on effective campaigning for pro-cycling policies. Lots of learning points for LCC's 2014 local election campaigning. Eighth Event: Friday 22nd November, 6pm - Cycling Policy in Ghent. 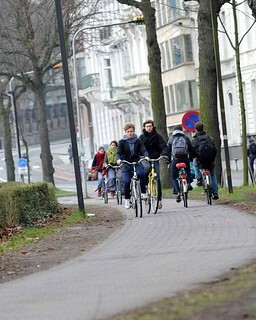 In May 2012, Ghent City Council won a Eurostar Ashden Award for Sustainable Travel for its active support for cycling. Cycling now accounts for 19% of commutes in Ghent compared with 12% in 2001. Peter Vansevenant, the Head of the Transport Section of the Municipal Mobility Company of the City of Ghent, spoke about Ghent's success and the challenges that remain, while a discussion focused on lessons for London. This seminar was supported by the Ashden Trust. View Peter's slides here. Ninth Event: Wednesday 22nd January, Cycling & Transport Modelling. 70 people from academia, practice, and advocacy groups spent the day discussing problems, developments, and key issues related to cycling and transport modelling. This was part of the ESRC Modelling on the Move series: presentations and audios will be uploaded to the series website. Thirty people with a range of expertise gathered to discuss how London can move towards inclusive cycling policy, with presentations from Isabelle Clement (Wheels for Wellbeing) and others. More here. This event was organised by Ellen Stuart and involved facilitators from outside the cycling movement, bringing their experiences of victim-blaming to the event and leading interactive discussion around dealing with victim-blaming in the media, policy-makers, the public and advocacy groups. More information to be uploaded. 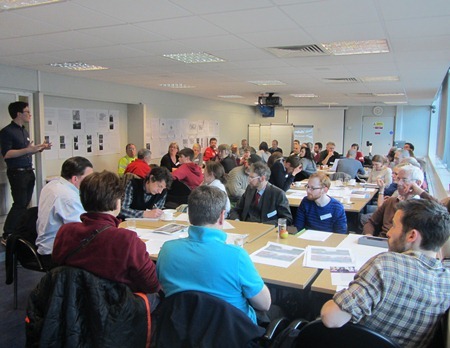 Our twelfth seminar was co-organised by the London Cycling Campaign and Living Streets. It focused on how transport and streetscape investments can cater well for both cycling and walking, mitigating conflicts and taking opportunities to provide excellent environments for both modes. Following an introduction, the fifty participants broke up into small groups, with expert facilitators including John Dales (Urban Movement), Brian Deegan (TfL),Esther Kurland (Urban Design London), Caroline Russell (Islington Living Streets), Bruce McVean (Movement for Liveable London) and Mark Strong (Transport Initiatives). Each group firstly discussed what might be 'an ideal walking and cycling environment', then evaluated one recently completed/proposed scheme. A plenary discussion then drew out the broader issues raised and put forward some lessons for designing future street schemes. You can see a write-up and some material from the session here. Around 25 people came to our thirteenth seminar to hear Klaus Bondam speak about cycling policy in Denmark, past and present, and ask questions. Klaus is the director of the Danish Cyclists’ Federation. He was also the Mayor for Technical & Environmental Administration in Copenhagen from 2006 to 2008, eventually garnering the nickname “The Bicycle Mayor”. Thursday 23rd October - Women's Cycle Forum. Around 45 people came to debate issues around inclusive cycling, social media and activism, cycling in Outer London, and improving the gender balance of cycling in London. Panellists were Caroline Pidgeon, Sarah Burr, Isabelle Clement, Charlotte May, and Sally Hinchcliffe. You can download notes from the five groups here. Thursday 27th November, 6:30pm: Our 17th seminar was a packed joint event with the Movement for Liveable London on Mini-Hollands. After presentations from officers from all three boroughs, there was Q&A, debate and discussion from the floor. Slides now available.